After 14 MLB seasons, Kerry Wood's playing career is coming to an end. 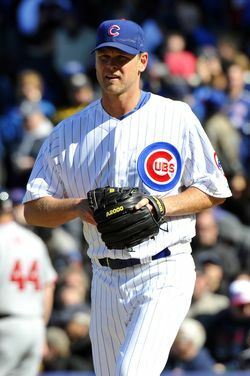 The 34-year-old right-hander plans to announce his retirement, Bruce Levine of ESPNChicago.com reports. Wood will retire after making one more appearance this weekend, MLB.com's Carrie Muskat tweets. Wood debuted with the 1998 Cubs and it didn't take long for him to make an impression. He struck out 233 hitters in 166 2/3 innings as a rookie, including a record 20 strikeouts in one game against the Astros. After being named the NL's 1998 Rookie of the Year, Wood missed his sophomore season to undergo Tommy John surgery. He returned to the rotation in 2000 and started effectively for five seasons, but had trouble staying healthy and transitioned to the bullpen, where he pitched exclusively from 2007-12. Wood signed a one-year, $3MM contract with the Cubs this offseason, but struggled through nine appearances, allowing nearly one earned run per inning with twice as many walks (11) as strikeouts (5). Wood's contract included a $3MM club option for 2013 which will no longer be in play for GM Jed Hoyer. The two-time All-Star will retire with a 3.67 ERA, and 86-75 record, 1379 2/3 innings pitched and 1581 strikeouts. Wood, the fourth overall selection in the 1995 draft, earned more than $70MM in his career, according to Baseball-Reference. He is a client of SFX. Poor Cueto and Latos. They are doomed. Way to be a team player Kerry. Kerry Wood should always be looked to as a guy that put his team and his teammates ahead of himself. I’m glad he is going on his own terms, would have been too easy for him to just limp through the rest of this season. The guy will never NOT have a job with the cubs unless he doesn’t want to. How many other people you know would turn down almost 2 million bucks to be a ‘nice guy’ ? I suspect it’s easier if you’ve made $70M in your career. rich people are usually the cheapest. Gil Meche and he are class acts. I love the need to make the news local. Shame to see him go however. Ok this surprised me. Kerry Wood only earned $70MM when a guy like Prince Fielder gets a contract of about $210MM? For 9 years? Kerry played fourteen years and only earned 70MM? Does that statistic not make your eyes pop out of their sockets? Millions more in appearances and sponsorships. This doesn’t surprise me at all. Kerry Wood unfortunately could not stay heatlhy. As a starter, he only pitched a full season 3 times, once was his rookie year. Prince Fielder has played in at least 157 games every year since becoming a full time player (also started his career about 8 years after Wood did, and obviously since 2000, 9 figure contracts are becoming more and more). I’m not saying Fielder will be worth that much, but it doesn’t shock me that Wood only made $70 million. He was great from 1998-2003 (he didn’t play in 99), but he fell apart after that. Prince got his deal while hitting the free agent market in his prime (after 6 consecutive healthy, impressive seasons). Although Wood played in 14 professional seasons, you have to remember that the team has control of the player for 6 years. The first three seasons (assuming no super-two status), the player doesn’t earn much more than league minimum. The next 3 seasons the player is eligible for arbitration, again earning less than what the player would conceivably earn on the open market. This, compounded by all of the injuries that he accrued over his career, are the reasons that he never receiving a long term deal. not really… he got injured pretty young and never really got that big longterm deal. Health man, never could stay healthy. He had great stuff always, second highest k/9 after Randy Johnson. But health, they said he was the next Nolan Ryan. I saw his 20 strikeout performance on tv, the most dominating game I’ve ever seen, and I saw Randy’s perfect game vs ATL also. Kerry Wood was never a superstar, and they’re from slightly different eras. Kerry’s career as a starter was done by the time Prince made his MLB debut. I totally agree. This is a classy move by a class act guy. He knows he is hurting the team, and doesn’t want to keep getting a paycheck while not performing up to his own expected level. He is one of those Cub players that you expect to always be around the club for many years to come. Hopefully Theo & Co. have a spot all ready for him! well said Dan. Kerry always was a great guy – in public and in the private world. Ran into Kerry and his wife one night at dinner several years ago and both of them couldn’t have been more pleasant. Godspeed on the next part of your life Kerry. I’ve always hated the Cubs, but admired Kerry Wood (and Ryan Dempster) as a class act. He’s been a role model to younger pitchers in the league on how to handle both success and adversity. Regardless of what the future has in store for Kerry Wood, he’ll be ok – he’s a good guy who thinks of others. Baseball needs more guys like that. Sorry to hear that. As bad as he was this year………I think most of us expected him to bounce back. If the Cubs bullpen situation was bad before, it’s really bad now. Well, man. I don’t know what to say. This is a crappy day, and it’s not even 10 AM. I wish Kerry the best and thank him for putting so much into the team and the city. Damn Kerry. Been a helluva ride. My favorite Cub going out in a classy way. Much respect. Kerry Wood: Cub for Life. They should pay him just to show up to the ballpark and teach the younger players how to act like pros. Cubs are good at making some players seem Great that are only so/so…as his stats show. Of course being hurt often brought him as well as Pryor to not having great careers.. Not a Cub fan. But know these two would have possibly been great if not for constant injuries, There is the Jinx at work for the Cubs. and doubtful if it will ever go away. Give Epstein and his Train 3 years and they too , will see the handwriting on the wall. And Give up. Probably move on to greener pastures. Not staying at the dead brown Ivy cursed situation. donWsox !! You are a joke. I hope when you retire, if you work, nobody says a word to you as you walk out the door. Classless and typical uninformed sports fan wannabe. Get off the board. I certainly hope Cub fans give this the attention it deserves. Has there ever been a more successful middle reliever? With 86 wins, he averaged 6.1 wins/yr over his storied 14 yr career! HOF!!!!!!! Don’t push it. Great career nothing more. I’ve said this before and i’ll say it again. Kerry Wood and Mark Prior were the Cub’s best chance at a world series a few years back and become a perennial playoff player in the NL Central. Unforunately, the FO & Manager RUINED their chances AND careers of BOTH these pitchers by allowing them to log so many innings, abusing their arms early in their careers. The medical staff and trainers did not help matters either. The Bartman incident finished was a whole separate issue, but ultimately it blew the morale of that team and the rest is history. Wood’s high school coach has been blamed for riding him hard. Additionally in Wood’s rookie year, Riggleman had Wood throw 120+ pitches in over a dozen of his starts (just going off memory). There’s really no way for sure how much over-pitching is responsible, but it’s not a wild conspiracy to say that it contributed. I tend to think that it was a combination of Wood being injury prone, being over-pitched, and maybe some unknown factors. Isn’t the Cubs GM Theo Epstein, not Jed Hoyer? Epstein is the team president, Hoyer is GM. He went out with Class a Rarity these days. Good Luck Thank you for a Year from your Life. I was happy you go out a Cub. I still think you can Pitch, but you know BEST. Yankee fans saw him for a short time at the end of 2010-great pickup, hard worker, high performance, and we were sorry to see him go. i remember watching that 20k game. it was one of the most amazing performances i got to see in real time. all the best to him. Old guard of cubs is gone. They just need to bite the bullet and. Trade soriano while eating 80% of his contract and finally finish the culture change that is the new cubs. Kerry can now move to the booth. I’d be shocked if a team were willing to trade for Soriano even if the Cubs took on 80% of his contract. I honestly don’t understand how sad this makes me feel. You had a great career, Kerry — and somehow you still had the potential to be so much more if injuries hadn’t derailed it. I’m sure the Cubs will find a place for you in the organization. Your attitude alone is worth having you aboard. I don’t cry for anything, but this got me emotional. Great career Kerry, great last moment in baseball ended with a strikeout, a standing ovation, and hugging his son. Kerry Wood does not have the greatest stats but, in Chicago, at least on the north side, he was the man. He stayed in Chicago, even at reduced rates, not like Maddux. Wood was a great Chicago Cub pitcher for how he pitched as well as for being accomodating to the team, the city, and professional baseball. For these reasons he is a Hall of Famer in every Cub fans eyes. Please don’t compare Kerry Wood to Greg Maddux. Maddux chose to go to the Braves not because of money, but because he wanted the chance to win a World Series (which he did). Maddux turned down more money from the Yankees to sign with the Braves, so it shows he wasn’t in it for the money. And there is the little point that Wood didn’t STAY in Chicago. He left and pitched for at least two other teams before coming back. You know Ron Santo went out as a White Sox, Billy Williams as an Oakland A, Ferguson Jenkins as a Ranger (I think). Wood went out as a Cub. He did not want it any other way. Congatulations on a great Chicago career. We Cub fans will never forget what you gave to these teams. No, Jenkins did return to the Cubs. I remember he retired after giving up two home runs to Mets pitcher Walt Terrell in one game. Kidding aside.. Any man who won 20 games his 1st 6 years and 7 outta’ 8 (Jenkins) can retire as anything and any team they desire…. I like Kerry Wood as much as the next guy and am glad he got such a touching moment to go out on, but there is no way a reasonable argument can be made for him EVER getting in the Hall of Fame, as a player at least. Maybe if he becomes a stellar front office guy or broadcaster for the next 30 years, then you can talk about his chances of making it in as one of those, but not as a player. I’d be surprised if he stays on the ballot after his first year of eligibility. Exactly. Lee Smith didn’t get in and he was a dominate closer for 15 seasons. Wood was a fair SP, fair lat (as in 7-8th IP) reliever and a hometown favorite.. NOTHING else. I am sad to see him go. He’s one of those players that gave you everything he had every time he stepped on the mound. Too bad injuries interfered; he still had a pretty good career and has always come across as a decent fellow who was totally bada@@ on the mound. Even though his career will be a lot of what ifs, to me, he’ll be more like Jason Isringhausen as opposed to Paul Wilson and Bill Pulsipher (in terms of comparisons). Wood at least ended up having a decent career as a reliever (just as Isringhausen ended up with 300 saves).